Halfway up his walk, he stopped in mid-step and stared at the large, fat, orange and white tabby cat now sitting on his stoop. Blocking his door. The cat blinked at him as if amused. No luck. 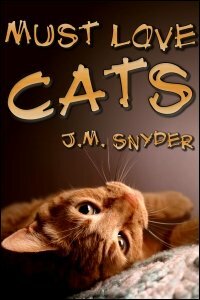 The cat sank down on all fours, watching him, as if it could hear the sudden pounding of his heart. Had he mentioned he wasn’t a cat person? They set him on edge -- they were too fast, too stealthy, too unpredictable. “Come on,” he pleaded, taking a step nearer. The cat’s ears swiveled, but otherwise, it didn’t move. In his sandals, he didn’t dare get too close. He could only imagine how those sharp little claws would feel sinking into the exposed skin on the top of his foot. Why hadn’t he stopped to slip on his sneakers? Another step, a third, then mercifully, the cat stretched its tail in the air and jumped down off his stoop. Before it could change its mind, Dale hurriedly crossed the few yards separating him from his home. The door wasn’t locked -- he twisted the knob, pushed open the door, and felt the revolting press of a small body against his lower leg as he stepped inside. Even as he closed the door behind him, he knew the cat had snuck in. Sure enough, it strode across his kitchen floor, tail in the air like a question mark as it darted under the table. The cat, safe under the table, sank to its haunches and began to lick one of its front paws. Its eyes shut as a contented purr filled the kitchen. Slamming the door shut, he snatched up his cell phone from where it sat on his counter and pushed the SEND button twice to redial the last number he’d called. The phone rang as he glared at the cat. The damn thing refused to look at him. “You fucker,” he spat. Before he could reply, the phone went dead in his ear. He tossed it onto the counter, sure she was on her way. Jill lived in the townhouse three down from his, and sure enough, within seconds he heard a door slam outside. Soon he picked up the sound of slippers shuffling on the sidewalk, then a rapid knock hammered on his kitchen door. As he reached for the knob, it turned and the door opened, spilling Jill into the apartment. Bleached curls tumbled atop her head, but her blonde bangs were smoothed down across her forehead and held in place with a small, silver barrette. Her heart-shaped face had a freshly scrubbed look, but even without her usual Goth make-up, she was a pretty girl. Her cheeks were pinked from the cold, her lips damp with Chapstick, and the hoop she frequently wore in her nose had been replaced with a tiny stud for the night. Black liner still edged her eyes where she hadn’t quite managed to remove it all. It gave her a wide-eyed, frightened appearance, accented by the oversized bomber jacket in which she snuggled. In response, Dale pointed at the table. Or rather, under it.